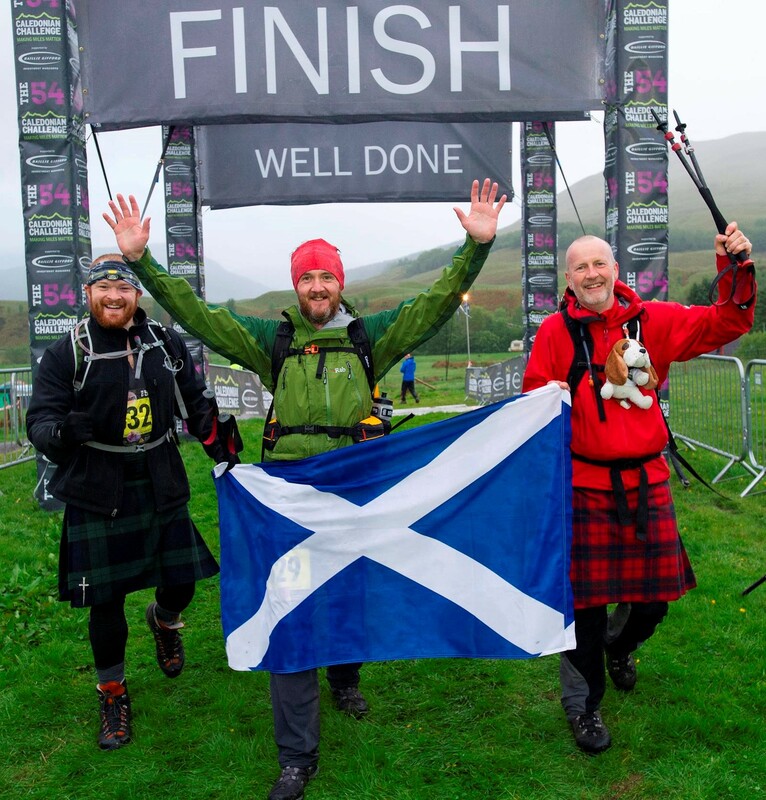 At 05:16am on Saturday morning, wet, tired and aching I crossed the finish line of the 2015 Caledonian Challenge with two team mates from the Sleakit Beasties. During the previous 20 hours and 16 minutes we had walked 54 miles from Gairlochy to Strathfillian, mostly on the West Highland Way. 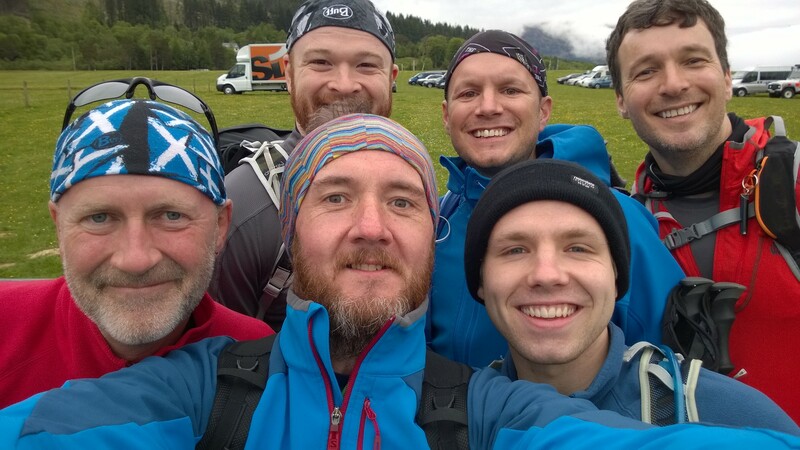 In the process, we had raised over £4000 for Foundation Scotland. As weekends go, this one was pretty amazing and certainly memorable. Taking on this challenge was my idea a year ago. I was catching a flight from Edinburgh to London for a business meeting this time last year and picked up a copy of the Scotsman newspaper as I boarded the flight. In the paper was an article from one of their reporters who had taken on the challenge last year and had written a piece about the experience. At the time, I’d never stepped a foot on to the West Highland Way, so I was captivated by his descriptions of the scenery along the route. There was also a lot of talk about the team work required to complete such a challenge and the impact it had on the workplace as a result. At the time, our local office where I worked was needing an injection of excitement beyond every day work, so I posted a message on an internal social media site asking if anyone wanted to join me taking this on. Surprisingly I got 6 other suitably crazy individuals signed up within a week and the Sleakit Beasties, a traditional name used by Microsoft Scotland for teams entering sporting and charity events, were born. We had some fun training for the event, then the weekend of the challenge came around and we were all loaded into a coach heading for Fort William. The challenge is a supported event and you have the option of providing your own support teams or signing up to a support package provided. We chose the latter option as we couldn’t hustle together enough people to run around the highlands after us cooking food and attending to our blistered feet. In the end, we were really glad we did as the support team provided were exceptional. The package also included a night in the Alexandra hotel in Fort William for the Friday night before the start. We arrived into Fort William on a sunny afternoon for registration in the Nevis center. The formalities were easily worked through and we were delighted to discover that we had actually won a t-shirt each for our fundraising efforts. Once we had checked in to the hotel, the Grog and Gruel pub provided us with dinner and drinks before an early night. The start line the following morning was out in Gairlochy. We were amongst the 9am start group, which was the third wave of people to start, with others setting off at 7 and 8am. Our estimated finish time was 20 hours which earned us a place in this group, the objective presumably to have most teams finish around the same time. The conditions at the start were near perfect with a light breeze and cloud cover. We were ready. This section was probably the easiest we were to take on. It gave us a chance to settle into a steady pace and adjust our clothing to match the temperatures. The route follows the Caledonian Canal from Gairlochy down to Neptune’s Staircase before heading off towards Fort William and the bottom of Glen Nevis. The field split up nicely along this stretch, and by the time we reached the first CP we were towards the front of our start group and ready for lunch in the support tent. The support package we signed up to meant we could provide a bag each with bits and pieces in which we didn’t need along the way. This worked exceptionally well throughout all the CP’s, meaning we could leave heavy items we didn’t always need, spare changes of clothing and snacks in the drop bags to reduce the weight. By the time we made it to the next CP, our bags were magically waiting for us. This was the stretch we had started our night walk on a few weeks earlier, so it was the first time I’d done this section in daylight. 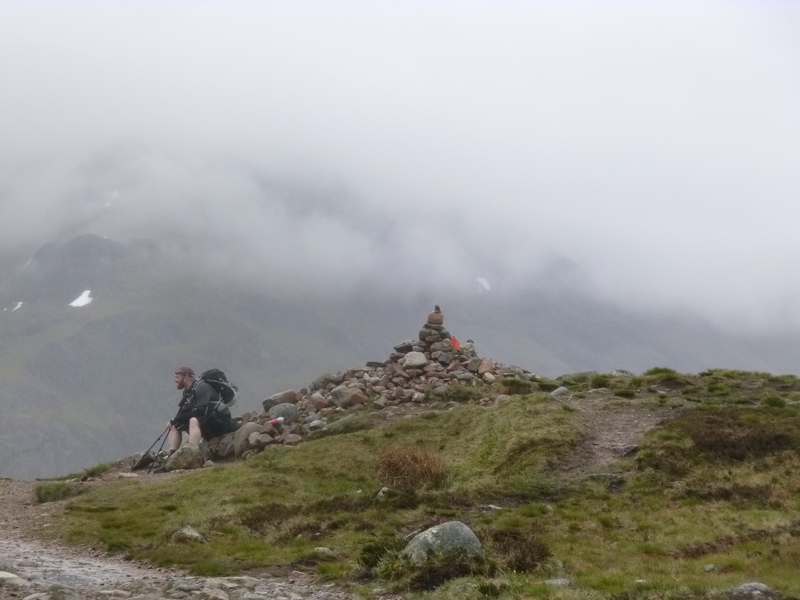 We knew it was a steep ascent from the CP up into the Glen and towards Lairig Mor, so we hit the carbs in the CP, dropped as much weight from our bags as we could and made a start up the trail. Within our group we had a range of abilities and the track up the glen was the first place where this started to really show. Some of the team were taking things slower to ensure they made the distance, whilst others worked at the hill to get it over and done with as quickly as possible. Before long though, we had all made it up on to the mor. It’s amazing how your memory plays tricks on you, I remember doing this section through Lairig Mor from the top of the Glen to Kinlochleven a few weeks ago and was sure it was much shorter than it actually is. I was painfully made aware of how long a stretch this section of the WHW actually is on Saturday, just as light drizzle started to coat everything. 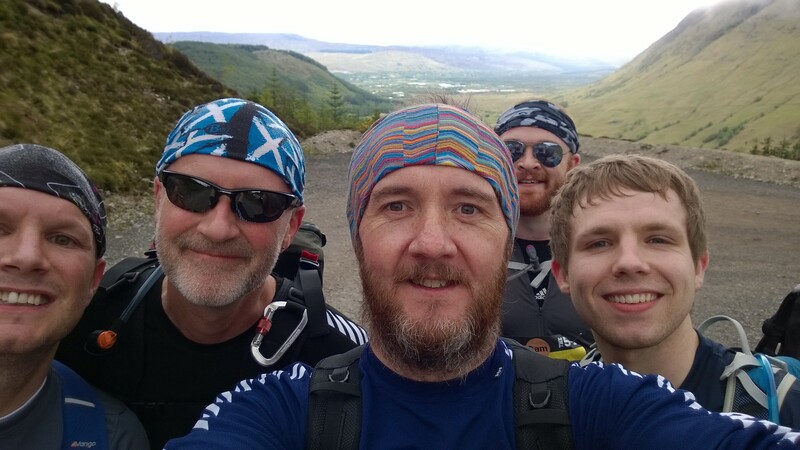 By the time we reached the descent into Kinlochleven, our group had split up into two groups, with one slightly slower and one, which I was in, pushing ahead. 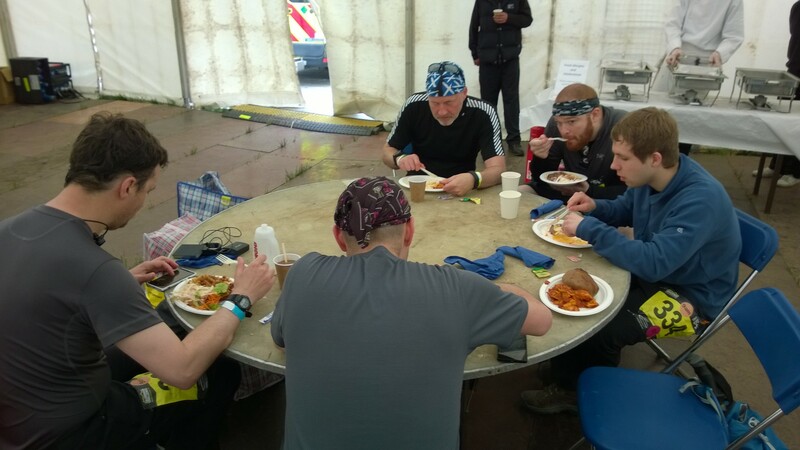 The CP at Kinlochleven was in the Ice Factory, they put on quite possibly the best lentil soup I’ve ever tasted as well as pasta or chilli to feed us. 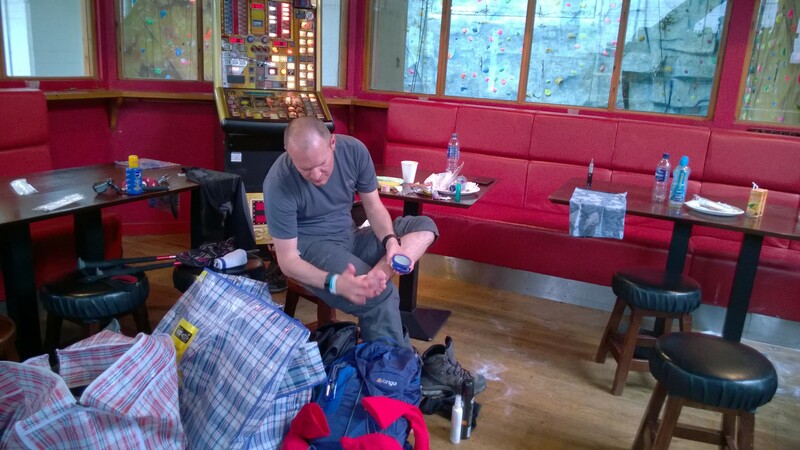 One of our advance party group had some significant blisters appearing at this stage, so we extended our stay here to allow some medical treatment before heading out. This was the meat of the walk. We always knew it would be, and it didn’t fail to deliver. The initial climb up out of Kinlochleven is unforgiving and long. i remembered taking this on in our training weekend and took a stern approach of simply pushing on up the hill at a steady pace. I enjoy this type of climb and I’d like to go back and have a go at running this section some time soon. Once up out of the town, there is a slightly less steep section to cross before summiting over the Devil’s Staircase. As always, the view here down into Glencoe is sublime and makes the hard work worthwhile. From here, the decent down into Glencoe feels luxurious after the previous climb and the distant lights of the Glencoe CP taunted us with the promise of hot food, clean clothes and somewhere warm and dry. Sadly, the view across the glen is deceiving and it was another significant walk before we were indulged. As we arrived in Glencoe, the weather intensified from mist to rain status. After a feed at the CP, by now it was 11pm and we were all tired. One of the team dropped out here due to intense blisters and the rear party were still making their way across from the Devil’s Staircase as the advanced party pulled out. This section of the walk crosses Rannoch moor, one of the bleakest parts of countryside you will find anywhere. Finding it on a dark and rainy night with around 15 hours of walking already done could be described as character building. I don’t really remember the rain being all that heavy, but looking back I realise that it was and I just had my head down and was stomping across this empty place, determined to get to the next CP. Our time through this section proved that as we clocked up a significant pace. The path here is hard cobbles too and in the wet they make every foot fall feel painful and slippery. Eventually the CP appeared out of the darkness and more baked potatoes were consumed along with chocolate cake and custard. As I approached the checkpoint, a lady from one of the teams I passed mentioned the chocolate cake and I thought she was simply dreaming of what she’s like to eat. I was delighted to find the cake waiting though, it was just the positive mood swing I needed. 40 miles down, 12 to go. Our stop at Inveroran was a quick one as we just wanted to push no by now. We later found out that our rear party dropped out at this stage, struggling to keep on with the conditions. They had but in a great effort and will be back next year I’m sure. That left just three of us still in the team, myself, Ricky and Duncan. Outside Inveroran is a small but perfectly formed hill waiting for any tired walkers heading south. As we left the CP, I felt my shins ache with pain from what I suspect was boots that were too tight throughout the day. The walk up and over the hill to Bridge of Orchy was slow and painful for me, the heavy rain was taking its toll too and the other two guys were rightly pressing on to get the hill over and done with. I passed another team near the top with one guy who was limping heavily. I commented that it looked painful but kept walking on, I later learned from Ricky that the guy had just fallen and was heading to the next CP for first aid. I felt terrible for not stopping, sorry if you are reading this. By Bridge of Orchy, we were all in what I’d describe as overnight mode. Conversation had dried up, everything was wet, all we were ever focused on was the beam of light from our head torches in front of us. Water points came and went, three of them in total. In each was a team of volunteers who did everything they could to lift our spirits. Throughout the whole event, it was breathtaking to see how many people gave up their time to support the challenge. Thank you, all of you, for doing such an amazing job and making such a significant contribution to making the challenge so much fun. From looking at the OS map beforehand, the path here seemed to contour around the side of a glen. It might have done, but it was too dark to tell and I was too tired to care by now. I remember heading under a railway that had some very ghostly looking carriages sitting in a station with some lights on, looking like a scene from an old movie. Beyond that, all I remember is more cobbled path, more rain, a soup kitchen and another short climb over a hill before heading down into Tyndrum as daylight appeared. I do remember at one of the water stops in this section, seeing two guys in every day football shirts, shorts and trainers stepping back out onto the trail. They were both soaked to the skin, but by the looks of their race numbers had set off at the same time as we did. They both seemed in fine form and were moving on up the track as if they were on Buchanan street in Glasgow on a Saturday afternoon. Well done lads, I hope you made it back safely! Before long, we were wandering past the By The Way campsite in Tyndrum and the pleasant section of path that meanders along the river there. Memories of the fling came flooding back as I passed the point where the pipers stand at the finish. Not long after, we turned over the bridge near the Strathfillian wigwam site and the finish line was in sight. The CEO of Foundation Scotland, Giles Ruck, was on point to welcome us at the finish with enthusiasm which was almost as large as his smile. he very smartly coached us to cross the line, arms in the air enabling the perfect photo opportunity. After the finish, fatigue hit us all and with a hearty breakfast provided, some of us settled down to catch up on a couple of hours sleep in a tent before catching the coach back to Edinburgh at 8am. The sense of achievement was immediate. It is really quite a significant distance to be walking in one day and to do it under such a well organised event made it all the more memorable. It was the first year in the events 19 year history that a team from Microsoft has entered, but I suspect many of us will be back again next year. I had a ball leading the team, everyone really got into the spirit of the challenge and in the process raised a huge amount of cash. I’m exceptionally proud to have been lead Sleakit Beastie. Hopefully we will have many more challenges ahead together too. The one thing that struck me on the drive home was that in just over two months I have completed the length of the WHW in a little over 30 hours. 53 miles in the fling and the remainder in the Caley Challenge coming from the other direction. Now I know where I’m going, I can’t stop thinking that perhaps the WHW race needs an application from me next year? My other though after finishing this, was that I much prefer running to walking. I remember being told at one point that it was 6 miles to the finish. In my head, that equated to about an hour, sadly, when you walk, those 6 miles took over two hours. 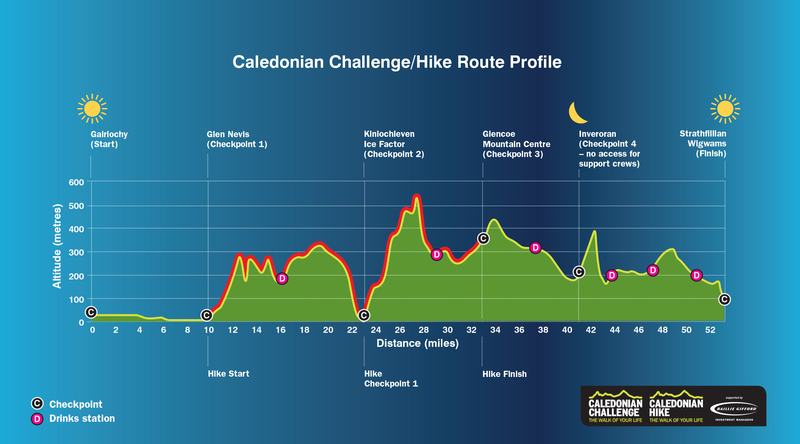 Next up for me is the Great Glen Way ultra on July 4th. I am really looking forward to that race now. It is such a beautiful part of the world that I am feeling more and more at home in. I need to build some more long runs in over the next couple of weeks to prepare and I should be ready to go, more on that over the next week. Well done guys, that’s fantastic! Brilliant write up, fancy this challenge myself! Thanks Rosie! I can highly recommend it. Amazing part of the world and a really well organised event.